My final project of 2018! This was a bit of a spontaneous make. Ive been holding on to a vintage skirt my friends mother had given me with a bunch of other clothes. She told me I could do whatever I wanted with them. The skirt was a pleated midi. It wasn’t really my style and it was too big. I absolutely loved the green velvet fabric though and realized there was enough fabric to make something new out of it! I was eyeing the Tilly and the Buttons Arielle skirt and thought it would be a great pattern for this. I bought the pdf and printed it Saturday night and made the skirt on Sunday. This pattern is great. Everything came together beautifully. Since this was a spontaneous make and I didn’t have any lining fabric on hand, I went for the unlined version. As I said in my last post, I want to slow down with my sewing. Normally I would have just serged my raw edges but I found some bias tape in my stash and took the time to sew it in. My stitching is less than perfect (the bias tape was a little thin for this fabric) but I still am really pleased with how it looks. To finish it off, I covered some buttons with the fabric. The only thing I might change is moving the placement of the buttons out a little bit. I marked the wrong edge when I tried the skirt on. Happy New Year! Thank you for following along on my sewing journey. I’ve had this project cut out since August or September and I’m so happy I finally got around to making it! The Pippi Pinafore is an overall dress with a fitted bib, patch pockets on the skirt and button fastenings on one side. I made it out of Marc Jacobs cotton velvet that I splurged on when I was at Mood fabrics in NYC over the summer. I’m pretty sure I only bought one yard so I managed to squeeze this pattern out of that! I’m really happy with the finished garment. I made it over a few evenings after work. It came together easily. The hardest part to me was attaching the button placket and facing but the illustrations make it easy to figure out. For the straps, you can use hardware or you can use buttons. I opted for buttons. I think the construction is very clever- using a button hole on the bib to pass the strap through and up to fasten. This pattern is a winner to me. I’d love to make a solid linen one for the spring/ summer! Simplicity 1325 – version 2! 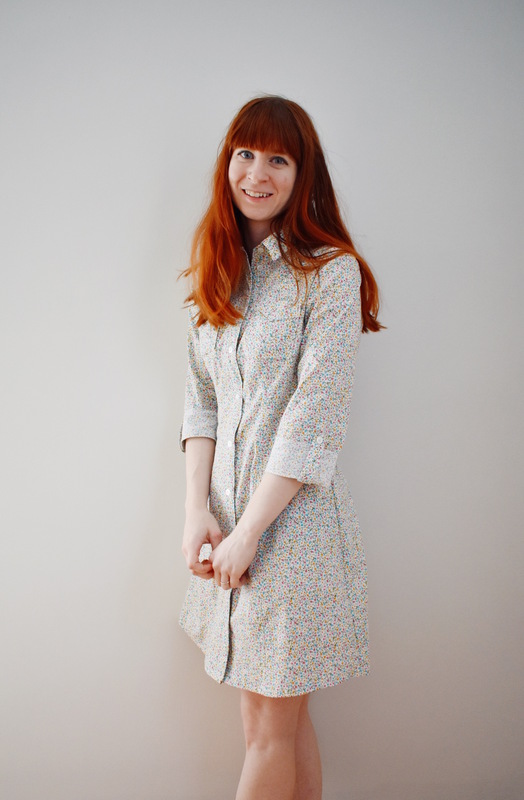 Today I’m sharing another Simplicity 1325! I was so nervous about wasting this fabric, I knew I wanted to make something I’ve made before. I definitely wanted a Pinafore style and I loved my red corduroy 1325 I made last year. It came out just as nicely as my first one. I see myself wearing this over turtlenecks and button ups this season. I added length to the tunic version on the skirt and opted for an invisible zipper instead of a lapped one like I did last time. I also didn’t put in the pockets and did a French seam on the skirt pieces. I used this beautiful mustard jacquard with rabbits on it from Miss Matatabi. Both sides of this fabric are so pretty so the inside of the dress is just as nice as the outside! It was my first time ordering from this website and I was not disappointed! They carry all different fabrics from Japan. The shipping was fast and the fabrics I purchased are so lovely and a wonderful quality. I will definitely be ordering more in the future.